We’ve been burning so much this spring under marginalweather conditions, that it was a surprise yesterday to have ideal weather for our burns. Not only did we complete our regularly planned burns, but we were able to re-burn many of the units that had not burned well in the February and March burns. As Amanda said: “The day everything burned REALLY well”. At 10 AM the temperature was over 50 F and the R.H. was 42%. By mid afternoon it was 70 F with RH around 30%. Of course it was April 24, very late for us to be burning, but you have to take what you are given. Fortunately (? ), the very cold April kept almost all of the plants underground, so they were protected from fires. The few species that had already shown a few shoots above ground should have no trouble re-growing from dormant root-stock. Why do we burn with marginal weather? Most of our burns involve oak savannas or woodlands where burn conditions are often iffy. However, it is so important to get these burns done that we do them when we can. The idea is that we can create reasonable peripheral black lines and get as much of the interior burned as possible. Then, if better conditions arise later, we can go back and re-light areas that did not burn well. And this is what we did yesterday. Unit 10 savanna burn of Feb 27-2018. Although black, there is a lot of unburned thatch. The same savanna after the re-burn on Apr 24, 2018. 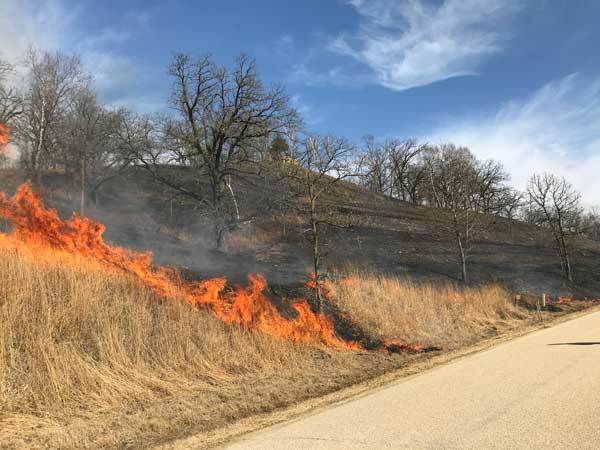 In contrast to savannas, prairie burns can generally be very successful in marginal weather conditions, provided the fuel is fully cured and the dead fuel moisture low enough. 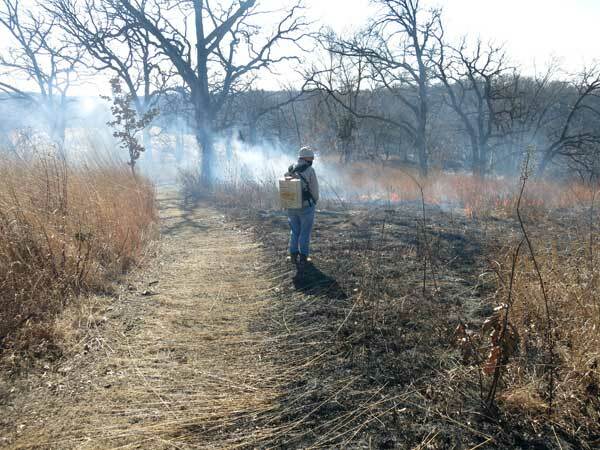 The same day that our savanna burn was not very successful, the nearby prairie burned very well. Restoration of oak savannas and prairie remnants is usually a complicated and expensive process, but real data on costs are hard to find. From time to time during 20 years of restoration work at Pleasant Valley Conservancy I was able to record times involved in various tasks. Since most work involved multiple workers, I have converted the time sheets into person/hours. Areas restored during the same activities were measured either by walking the periphery with a Garmin GPS or by GIS using air photos with ArcMap. The various work activities shown in the summary table need explaining. Most of the work considered in this post involves removal of woody vegetation, both trees and shrubs. 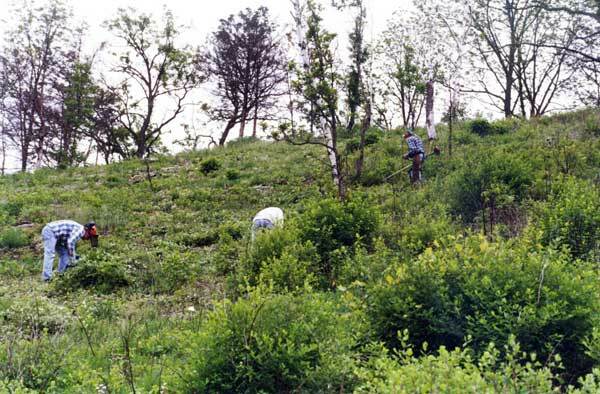 Removal of herbaceous plants, weeding, is a different activity and is not presented. Photos are added to present the context of the restoration activities. The procedures discussed here have been used on oak savanna or prairie remnants that are “restorable”. That means that they once were “good” remnants but had become seriously degraded because of grazing or lack of fire. They still had some native species and retained small remnant areas. One of the most efficient ways of eliminating woody vegetation is basal bark treatment with an oil-soluble herbicide that will penetrate the bark and kill the roots. Since basal bark treatment can be done any time of the year, it is often done in the winter when many other restoration tasks cannot be done. At PVC, 100 foot swaths were marked with flagging tape and workers move along these swaths, treating any target species. The treated plants died during the next growing season and the dead plants were left in place. In a year or two they fell over and slowly decomposed. This works best for scattered plants. 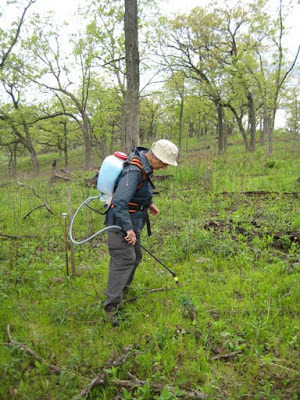 Denser populations of brush such as honeysuckle, buckthorn, or brambles, were cut with motorized brush cutters, followed by cut stem treatment with herbicide. Depending on the species cut, glyphosate or triclopyr was used to treat the cut stems. This procedure involved a team of people, one operating the brush cutter and three or four following with herbicide spray bottles. This procedure was used primarily on infestations of smaller shrub heights (2-4 feet), and the cut brush was just left on the ground to burn up at the next fire. 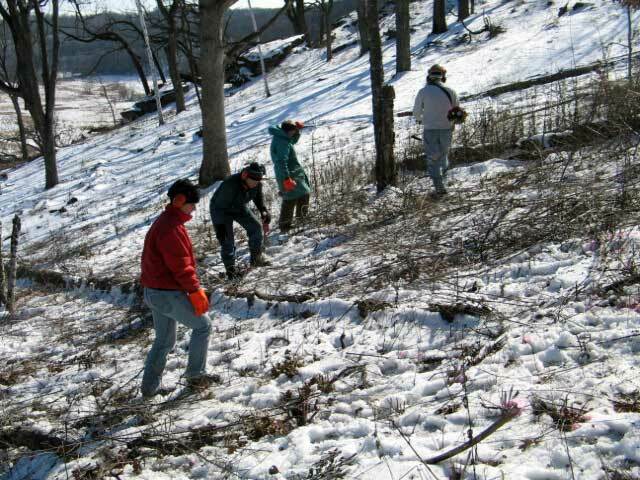 Many restorations involved the removal of invasive trees such as walnut, elm, cherry, and box elder as well as brush. Often these trees were 10-20 inches in diameter and an experienced crew (contractor) was needed. If the trees were smaller, so that removal was less technical, an experienced chain saw operator could work with a group of less experienced workers. 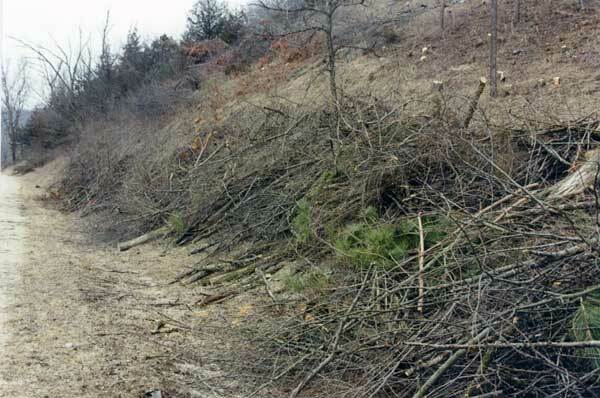 Tree work requires much more time because brush piles must be built, and the cut logs must be removed from the site. A very efficient method of removing brush is to burn the unit (either spring or fall). A properly conducted burn will top-kill the shrubs. In late spring or early summer new shoots will appear and can be sprayed with an herbicide such as aqueous triclopyr. This is a very effective procedure and is less time-consuming than others. There is no cut wood to deal with, and the sprayed plant is usually eradicated. In the fall, buckthorn and honeysuckle retain their green leaves long after all the native vegetation has senesced. Although the timing is variable from year to year, these plants can usually be killed by a foliar spray such as glyphosate or triclopyr. Remember: if it is green, it will be killed. Senesced plants (brown) will not take up herbicide. Glyphosate is preferred because there is no soil residue. Examples of the techniques used are given at the end of this post. I used hours per acre to express costs because hourly rates vary widely,. However, I have added a column assuming $25 per hour. $$ per acre based on $25 hourly rate; other rates are possible, or none, if the work is done by volunteers. Basal bark is one of the most economical methods of brush control. However, the dead brush is left standing, and one must wait a year or two for the dead stems to disappear. However, it could be used as a preamble to a major tree cutting operation. If it was known that a lot of trees were going to be cut in a unit in a year or two, it would be efficient to basal bark all the woody vegetation. The dead wood could then be used as the base of the brush piles that would be made from the smaller branches of cut trees. Foliar spray of resprouts after burns is another economical method of brush control. By spraying the resprouts before they get big, one is eradicating the plant and preventing it from getting larger. The principal problem is timing. Not all plants resprout simultaneously, so that it is necessary to canvas each area at least twice, and preferably three times. Also, spraying usually must be done in May when herbaceous weed control is also underway. Cutting and treating in winter. Light snow is helpful in keeping track of where the brush cutter has been. Cutting and treating near the Town road makes it easier to deal with the wood. This is the beginning of the major job to clear the whole South Slope. 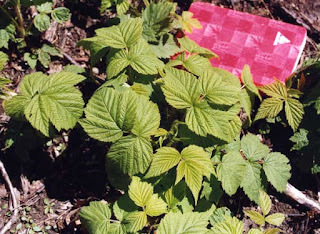 Bramble resprouts after top-killing from a burn. Spraying resprouts. It takes a good eye to locate all the resprouts. All woody resprouts are sprayed. A 3-4 person crew is ideal. Buckthorn green. All the native vegetation has already senesced. 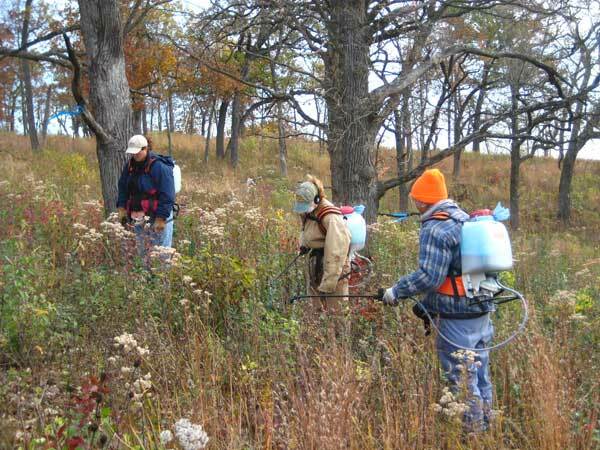 Four-person crew canvassing a savanna for green buckthorn. A systematic search of the whole unit is necessary, using marked swaths. Sumac can often be a serious invader in prairies and savannas. Although it is regularly top-killed by fire, it reprouts immediately. In addition, sumac root suckers readily, so fire can often appear to stimulate sumac growth. Recently I learned of a long-term fire study in oak woodlands of the Missouri Ozarks where sumac greatly increased with a four-year burn interval, whereas there was no sumac in unburned or annually burned plots. What is going on here? 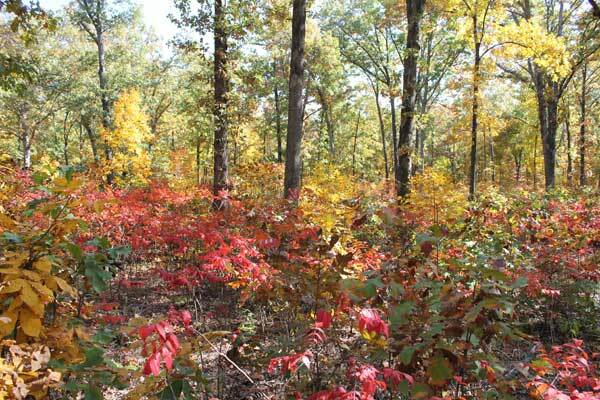 The study area is at the University Forest Conservation Area in Butler County in southeastern Missouri. There were three treatments: unburned, burned annually, and burned on a 4-year interval. This study began in the early 1950s and has been continued up to the present (see reference). Knapp and co-workers made extensive measurements of the understory and overstory in these experimental woodlands. There were a number of interesting observations, but the focus here is on sumac growth. 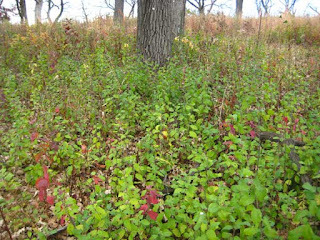 Neither the unburned controls or the annually burned plots had any significant sumac.However, sumac was the dominant shrub in the plots burned every four years (see photo). The species of sumac was Rhus copollina. How should we explain this? First, it is not surprising that the unburned plots have no sumac, since sumac does not grow in shade. Second, it is not surprising that the plots burned annually do not have any sumac, since it would be top-killed by fire. 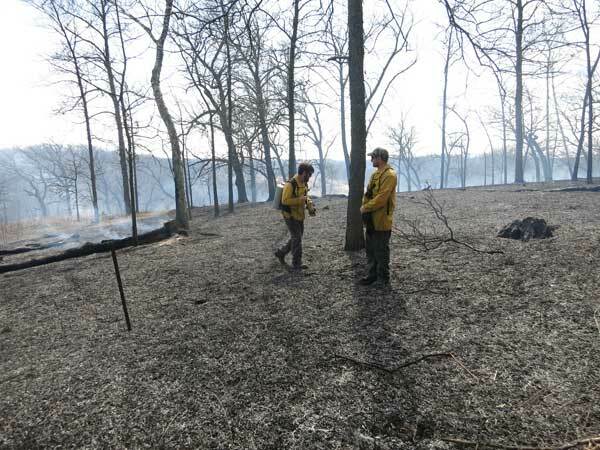 In fact, there is virtually no understory shrub layer in the plots burned annually. 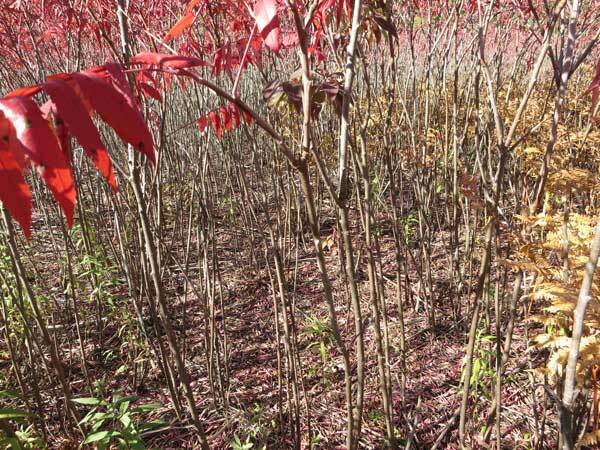 But how do we explain sumac thriving in the plots burned every four years? Most likely, the fire is unable to carry through the sumac thickets. The stem density of a sumac clone is high, and the leaves will prevent oak leaves, the principal fuel, from reaching the ground. It appears that once sumac gets started, there is no stopping it! This is not the first time I have heard about 4-year burn cycles not being sufficient to control brush. See the paper from Konza Prairie by Briggs, cited below. Knapp, B.O., Stephan, K. and Hubbart, J.A. 2015. 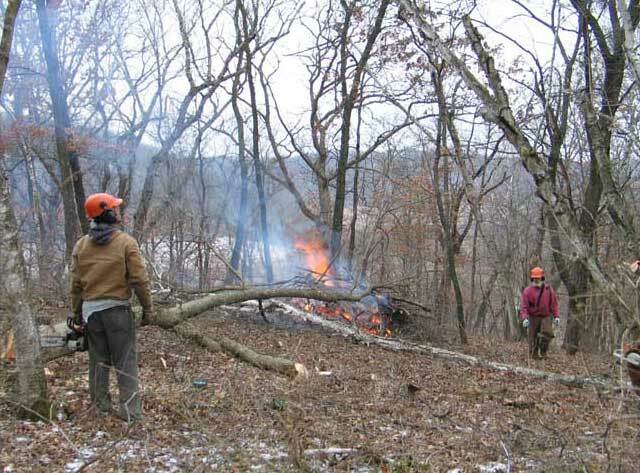 Structure and composition of an oak-hickory forest after over 60 years of repeated prescribed burning in Missouri, U.S.A.. Forest Ecology and Management 344 (2015) 95-109.